Located amidst the Western Ghats, Chikmagalur is popular for its lush green mountains, beautiful hiking trails and numerous waterfalls. Also known as the "Coffee land of Karnataka", Chikmagalur is one of the best hill towns of Karnataka. Visit Mullayanagiri which is the highest peak of Karnataka. WItness the architectural style of Hoysalas in Belur and Halebidu. Revive and rejuvenate at Manikyadhara waterfalls. Chikmagalur is a beautiful hill station of Karnataka. The place is known for coffee plantation. The area contains the Baba Budan Hills (Chandra Drona Parvatha). 'Gangamoola' - the source of rivers Tunga and Bhadra - is located near Kudremukh which is in Chikmagalur district. There are many scenic hills and destinations in Chikmagalur in which most important are Mullayangiri, Bababudan Giri, and Kemmangundi. In this sightseeing tour, we would be first visiting Belur and Halebidu which were under the rule of Hoysalas and we can witness the architectural style of Hoysalas. Then we will be visiting Mullayangiri, Bababudan Giri and Manikyadhara waterfalls. The guests are picked up from the hotel/residence in Bangalore at the preferred pick-up time selected while booking. After the pick-up, proceed to Belur which approximately 4-hour journey from Bangalore. Belur is popular for the Chennakeshava temple, a 12th-century Hindu temple complex famous of its elaborate stone carvings. Other attractions include Hoyasaleshwara Temple, dedicated to Lord Shiva it is the largest monument of Halibidu town. For some watersports, visit Yagachi dam and also the backwaters, we recommend our guests to carry an extra pair of clothing if they're going for the watersports. Hirekolale lake could be visited as well, it's a beautiful manmade lake. Mullayanagiri hills can be viewed from this point. Towards the end of the day, the guests will be dropped at their hotel in Chikmagalur. Day 2: Visit Mullayangiri, Bababudangiri and drive back to Bangalore. Start today's tour with a visit to the viewpoint of Mullayanagiri, which is the highest peak in Karnataka (we recommend a morning visit as the landscape is at it's best in the morning). Visit Baba Budangiri, a shrine to the Sufi saint Hazrat Dada Hayat Khalandar, a pilgrimage site for both Hindus and Muslims alike. If time permits, visit Manikyadhara waterfall which is situated in the dense forest of Bababudan Giri, hire a local guide if required. We recommend a visit to the Coffee Museum, even if you're not much of a coffee drinker. The museum offers a description of coffee production and making in great details. Post lunch, start the journey back to Bangalore and the guests will be dropped back to the hotel or residence (same as the day-1 pick-up point). Pick up and drop off (Bangalore city limits). Any cab parking charges and highway toll charges. The tour has a kilometre limit of 650 kilometres. After 650 kilometres, additional per kilometre charge will be applicable (to be paid directly to the driver). For Sedan (4-seater) - Rs.11 per km (additional kilometre charge). For SUV (6-seater) - Rs.13 per km (additional kilometre charge). 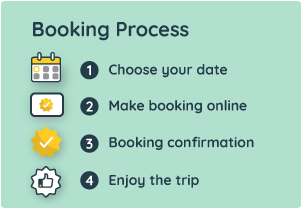 The driver will pick up the guests from the pick up address, so please provide the complete address in the booking check out page.